Who has a bigger supermajority than even Republicans in Utah’s Legislature? Latter-day Saints. (Scott Sommerdorf | The Salt Lake Tribune) The Salt Lake LDS Temple and the Utah State Capitol are seen together, Wednesday, July 26, 2017. In the incoming Utah Legislature, three of every four members are men. That lopsided majority is still smaller than the big margin Republicans enjoy: four of every five. So Latter-day Saints hold 87.5 percent of the seats, while recent state data show that 61.6 percent of Utahns are members of the state’s predominant faith. That means the number of seats held by Latter-day Saints is about 42 percent higher than their population would predict. Non-Mormons increased their numbers by one since the 2016 election. 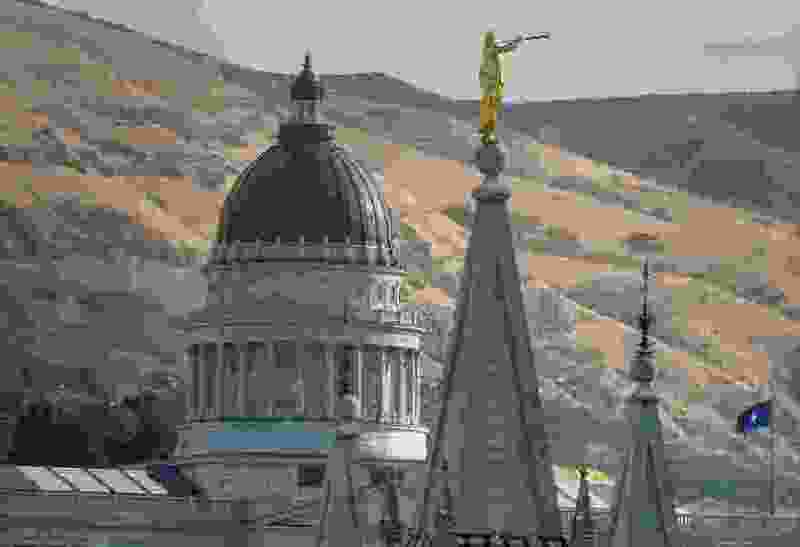 The Latter-day Saint supermajority raises many questions about the influence of the church on Utah lawmaking. Many legislators say the faith has little effect on most run-of-the-mill issues, but it does influence those in which the church has strong stands such as alcohol, gambling, marijuana, assisted suicide, immigration and gay rights. Outgoing Sen. Jim Dabakis, D-Salt Lake City, is a former Latter-day Saint who was replaced by another former Mormon, Democratic Sen. Derek Kitchen, who says he is now an atheist. Dabakis says the church and Latter-day Saint legislators seem less concerned in recent years with the view of colleagues who are not of their faith on key issues. “I’ve seen a dramatic change since Marty Stephens was hired by the LDS Church as its lobbyist” in 2017, Dabakis says. Stephens is a former Utah House speaker. Dabakis says that in past years, the church did not lobby just to marshal votes but also to listen to concerns, communicate and negotiate. 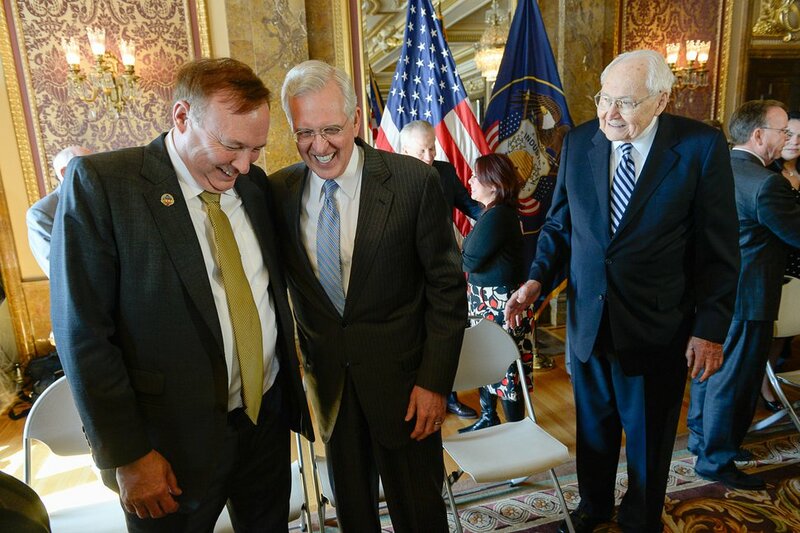 Francisco Kjolseth | The Salt Lake Tribune Sen. Jim Dabakis, D-Salt Lake, left, greets top Latter-day Saint leaders, including apostles D. Todd Christofferson, center, and L. Tom Perry as they appear at a news conference at the Capitol to publicly endorse nondiscrimination bill SB296. For example, he says that he and the late Latter-day Saint apostle L. Tom Perry had “excruciating, long and difficult meetings” before they came up with a 2015 bill to ban housing and job discrimination against gays. While such bills had foundered for years, once the church endorsed the negotiated legislation, it passed with ease. Dabakis complains that decisions, for example, about Utah’s new toughest-in-the-nation drunken driving law “were made by people who don’t drink and many of whom have never had a drink,” and drinkers and non-LDS folk feel disenfranchised. Dabakis also argues that Republicans work out most controversial issues behind closed doors in their caucuses — but they include only one non-Latter-day Saint, creating more than an impression that those outside the faith often become nonfactors. Incoming House Speaker Brad Wilson, R-Layton, who is a Latter-day Saint, says the church has been transparent in recent years when it has chosen to jump into a few key issues — allowing other sides to see what it is doing and also chime in. Another example, Wilson says, was two years ago when he sponsored an alcohol reform bill that included erasing the “Zion Curtain,” a barrier to prevent children and others from seeing alcoholic drinks mixed or poured. It “was very clear they were involved in that discussion,” and [church] support was crucial to passage. (Leah Hogsten | The Salt Lake Tribune) Rep. Brad Wilson, R-Kaysville reprimands the House gallery for an outburst of laughter during debate on the House floor. Utah legislators voted to change the Utah Medical Cannabis Act, the bill that officials, Prop 2 opponents and medical marijuana advocates crafted and pitched as a compromise, Monday, Dec. 2, 2018 during a special session. Lawmakers voted for an overwritten version of the ballot initiative. Only Utah and Hawaii ban all gambling, including lotteries — but many Utahns support the casinos in Nevada border towns like West Wendover and Mesquite, and flock to buy Idaho lottery tickets when jackpots are big. 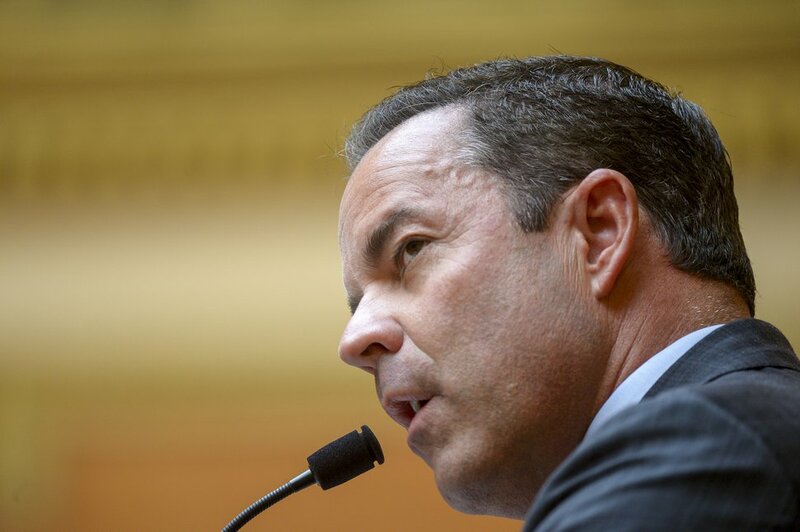 House Democratic leader Brian King, of Salt Lake City, who is a Latter-day Saint, says that, in his experience, the church is not a bully and does not strong-arm lawmakers as it lobbies. While King and others say the LDS Church does not bully lawmakers, one who disagrees is former GOP Rep. Carl Wimmer, who left the LDS Church to become an evangelical Christian. He created a stir in 2015 with a blog accusing the church of bullying Latter-day Saint lawmakers on illegal immigration and alcohol. Some legislators at the time backed Wimmer’s assertions. Others said they never saw anything like what he described. The church also says Latter-day Saint legislators are free to vote and act as they wish. With so many Latter-day Saints in the Legislature, how are others treated? Does it hurt their chances at passing legislation? “Not at all,” says incoming Senate Democratic leader Karen Mayne, D-West Valley City, a Methodist. “The only effect I’ve seen is that maybe they tease about coffee,” which devout Latter-day Saints do not drink, but which Mayne says helps her keep up energy on long days. 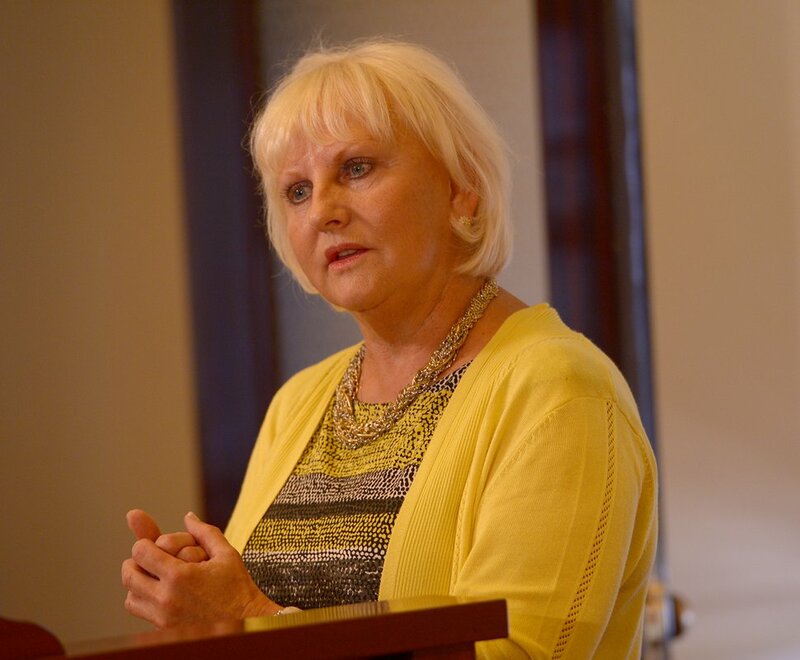 Leah Hogsten | The Salt Lake Tribune Sen. Karen Mayne held a press conference in the Utah Capitol's senate democrat caucus room to announce proposed legislation to remodel the DABC. If approved, the bills would create a customer and employee advocate position; and create a permanent funding formula to ensure adequate pay and training for employees. Members have plenty of theories about why so few non-Latter-day Saints are in the Legislature, and why almost all of them are Democrats. Dabakis says that for years, many in the church felt that to be a good Latter-day Saint, they had to be a Republican. And he asserts that Republicans gerrymandered political districts to give themselves advantages — which by happenstance also helped created the extra-big Latter-day Saint supermajority. “An argument could be made that religious discrimination occurred” by underrepresenting people of other religions, he says, and perhaps could be used to challenge future redistricting. By the way, King and Wilson say the perception that good Latter-day Saints should be Republican is changing. They both note that many top Utah Democrats are active Latter-day Saints, and Republican Wilson even notes “most of the LDS bishops who are in the Legislature are Democrats.” The church proclaims political neutrality. Twelve of the 22 Democrats in the Legislature are non-Latter-day Saints, while only one of 82 Republicans are. 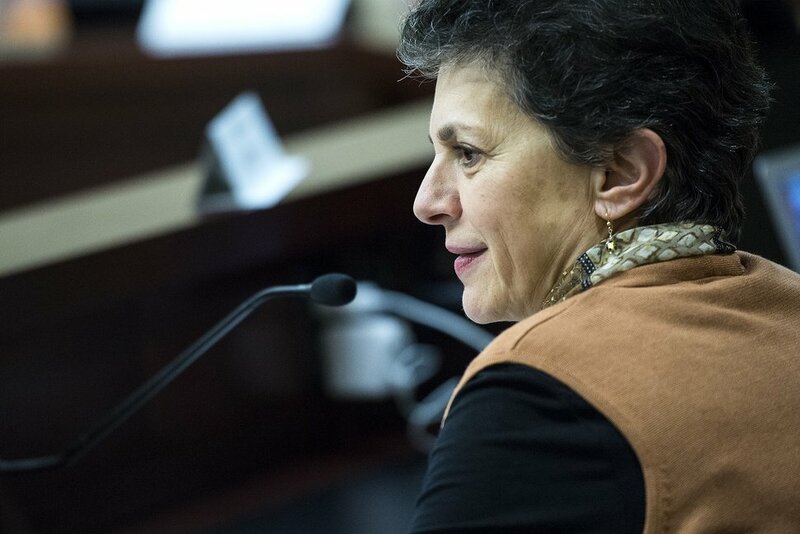 (Chris Detrick | The Salt Lake Tribune) Rep. Patrice M. Arent (D-Millcreek) listens about HB0068 during a House Government Operations Standing Committee meeting at the Utah Capitol Tuesday, January 30, 2018. • Senate Democrats: Jani Iwamoto (Japanese Church of Christ); Derek Kitchen (atheist); Karen Mayne (Methodist); and Kathleen Riebe (nonaffiliated). • Senate Republicans: Ann Milner (Baptist). • House Democrats: Patrice Arent (Jewish); Jen Dailey-Provost (nonaffiliated); Sandra Hollins (Baptist); Karen Kwan (nondenominational); Stephanie Pitcher (nonaffiliated); Angela Romero (Catholic); Elizabeth Weight (Unitarian) and Mark Wheatley (Catholic). Correction: Jan. 21, 7:45 a.m. >> An earlier version failed to include Rep. Elizabeth Weight, D-West Valley City, a Unitarian, among members who are not LDS.